People’s rights are under fire “in many parts of the globe,” UN Secretary-General António Guterres told the Human Rights Council on Monday [25 February 2019], before insisting that he was not “losing hope”, thanks to the progress made by powerful grassroots movements for social justice. UN Photo/Jean-Marc Ferre | A general view of the Geneva-based UN Human Rights Council in Geneva, which formally began it’s 40th session on 25 February, 2019. Milestones have been reached in recent years, that are key to human rights, the UN chief maintained. “One billion people have been lifted out of extreme poverty in just a generation,” he said. “It was the human rights struggles and successes of others around the world that moved us to believe in change and to make that change happen,” Mr. Guterres said of Portugal’s struggle to rid itself of the Salazar regime. In her address to the Council, Michelle Bachelet, High Commissioner for Human Rights, highlighted the dangers of ignoring climate change. UN Photo/Violaine Martin | Michelle Bachelet (center left), High Commissioner for Human Rights attends the High-level panel on human rights mainstreaming of the 40th session of the Human Rights Council at the Palais des Nations, in Geneva. At her immediate right is María Fernanda Espinosa Garcés, President of the UN General Assembly. Ms. Bachelet also hailed the young climate activists inspired by Swedish teenager Greta Thunberg. 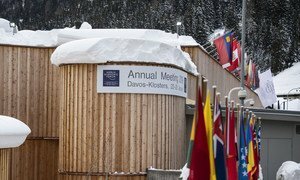 The 16-year-old who had grabbed the attention of the world’s media, recently travelled to the Davos World Economic Forum (WEF) in Switzerland where she called for the world’s decision makers to take swifter action to limit carbon dioxide emissions and reduce global temperature rise to 2°C above pre-industrial levels. In addition to improving women’s rights, the UN Secretary-General expressed alarm about the “shrinking civil space in every region of the globe”; and a rise in harassment, attacks and inflammatory rhetoric. To tackle this, the UN chief announced the creation of a fast-track strategy to scale up the organization’s response to hate speech and present a global plan of action, headed by his Special Adviser for the Prevention of Genocide, Adama Dieng. This kind of initiative was necessary in light of the political capital earned at the expense of migrants and refugees, who some leaders had blamed for a rise in crime and terrorism, the Secretary-General insisted. “We must re-establish the integrity of the international refugee protection regime and continue to work for common values and international cooperation to reassert rights and help protect people from ruthless traffickers, smugglers and other predators,” he said. 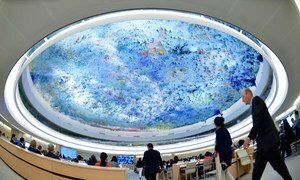 The current session of the Human Rights Council continues until 22 March. (SOURCE: UN News). There is nothing good about country internment and currency slavery.